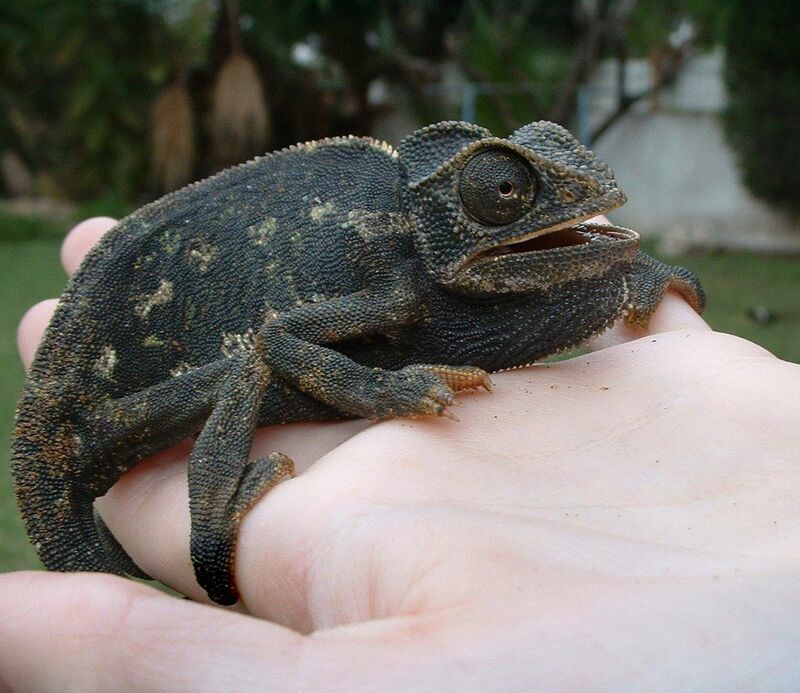 Since our childhood, we are taught that Chameleon changes its skin colour according to the environment it resides it. Now, what if I told you that’s a myth? Well, believe it or not. It’s flawed. 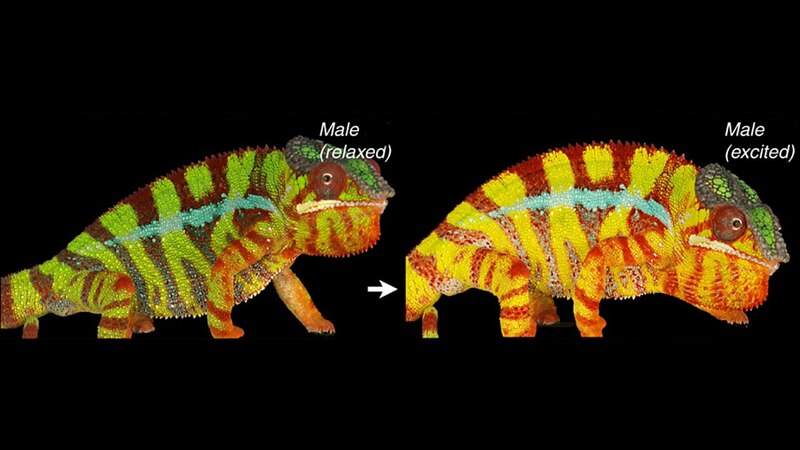 Color alterations in Chameleon are reflections of its MOOD! 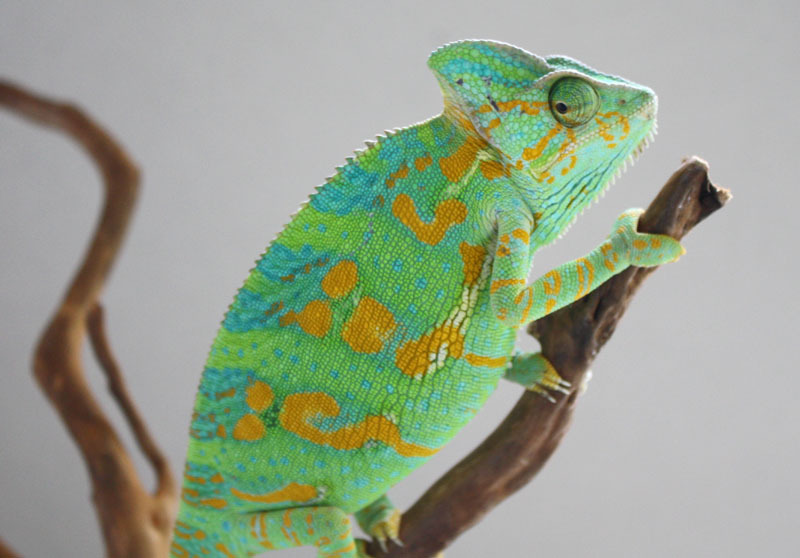 Several notable biologists have studied the phenomenon of colour change. Some scientists suggested that when placed in a mirrored room, the colours would regularly change, never settling into one. Some stated that it would remain the way it was before it entered the room. For instance, if it were on grass, it would remain green even in the room. The integument colour change is a social display, in order to adapt to any external stimuli including temperature shifts, emotions, and perceived threats. These quick-change artists have a skin surface comprising of pigment-containing cells called iridophores. A lattice of nanocrystals within a cell layer alters to reflect the light differently. When calm, these nanocrystals are present without many spaces and reflect blue and green light. This is the usual colour of the reptile. The chameleon is an isolated and solitary creature. Hence, the species does not show many interactions. A male chameleon gets alarmed on being confronted with another male ‘rival’ for females or habitat. On seeing the opponent, it switches its colour from camo-green to noticeable hues of yellow, orange and red. As the male looks at itself in the mirror, it assumes it is another male. It is immediately frightened and hence alters its colours in response. In this agitated reptile, the cellular space between the nanocrystals expands, allowing reflection of the light of a larger wavelength. Flustered males usually exhibit bright red and orange lights. The vanquished males show a darker colour, and it depicts that the reptile should be left alone. Scientists have found out that the female modifies its tone to convey its sexual status to males. To signal reproductive receptivity, it exhibits yellow spots. Such gestures are rare, which is because females choose males, rather than being chosen. On placing a female in a room full of mirrors, it parades subtle colours. But there aren’t enough articles supporting the fact. Scientists do not understand the female-female interaction well, yet. I’m sure you now know the folklore behind the reptile changing its colour!